On May 13, 2017, Natalie was on her way to meet up with her mother and siblings for a special Mother’s Day dinner in Manhattan. As a courtesy, she allowed a cop car to pass even though she had the right-of-way to cross the street. After the police vehicle passed, she stepped out and began walking across the street. In a matter of seconds, there was an SUV that turned left into the crosswalk and did not slow down! Natalie’s jeans (right side) were pinned between the front left tire and dragged for about 5 feet before the SUV driver noticed her. All Natalie could think of at that moment was to hold on for dear life! Natalie’s stepfather was in a similar accident a while back and sadly passed away from being thrown by the vehicle in that accident. With all the strength she had and thoughts of her dear stepfather, Natalie pushed herself to hang on! When the SUV finally stopped, the driver got out and started to video record Natalie on the phone…and that’s it! Natalie was transported by ambulance to Metropolitan Hospital where she was evaluated, treated, and released with pain medication. Due to the incident, Natalie suffered injuries to her neck, back, and the right side of her ankle/foot, knee, hip and wrist. A couple days after being discharged from the hospital, Natalie felt paralyzed due to the severe pain she was experiencing. An ambulance was called, and Natalie was taken to Harlem Hospital Center. She received an injection, medication, and was discharged home with a cane. Six months after the accident, an orthopedic surgeon recommended surgery to the right hip (tear of the anterior superior left acetabular labrum and anterior lateral superior acetabular labrum). Around this time Natalie discovered she was pregnant! While Natalie was still in need of surgery, treatment, and pain medication…everything was put on hold until the baby was born. Soon after her accident had happened, Natalie’s friend told her to call The Case Handler team at Pollack, Pollack, Isaac & DeCicco, LLP! With the help of our reputable New York pedestrian accident attorneys, we discovered that the SUV was a rented vehicle and that we had an opportunity to obtain additional compensation on top of the driver’s own car insurance. As a result of our team’s diligence and experience, we successfully recovered the maximum policy limits from both insurance companies and helped Natalie recover $25,000.00 from the car rental insurance and $50,000.00 from the Defendant’s insurance company for a total settlement of $75,000.00! 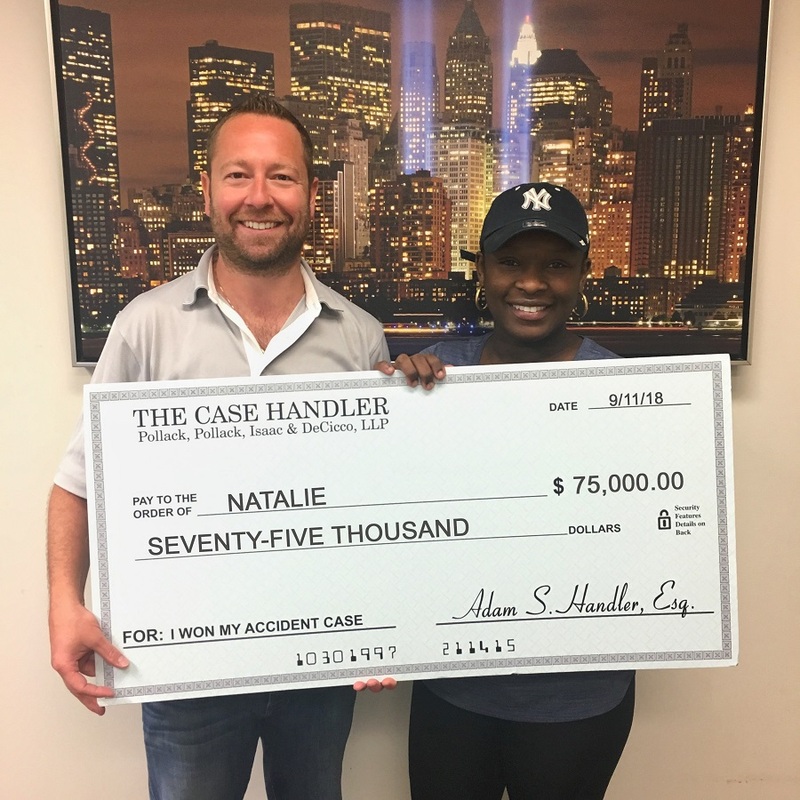 Congratulations on your settlement Natalie…and your healthy newborn baby! When pedestrian accidents happen, it’s obvious that a pedestrian is no match against a vehicle and it will be the pedestrian that will end up suffering the most. Drivers, have you ever wondered how you would feel if you accidentally took the life of a person walking across the street? There is nothing more important than someone’s life! That’s why we strongly encourage all of you – drivers and pedestrians – to please slow down and pay attention to your surroundings. Natalie’s heartbreaking experience losing her stepfather in a similar accident may be the reason why she’s alive today…and that’s why we share our client stories with you. So that hopefully their accident stories will teach you something that can help protect your future. If you or a loved one are injured in a pedestrian accident in New York, contact a reliable New York pedestrian accident attorney that will make “sure to get the help you need” and deserve.